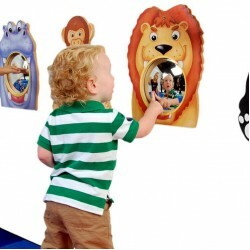 The Animal Friends Wall Mirrors make a great addition to any play room, classroom, waiting room or d.. The Bear Wall Panel is a wonderful addition to liven up the walls of any play area, classroom, waiti.. The Blowfish Mirror Wall Panel is a dynamic addition to any room and is captivating for children and.. Need a fun toy without taking up all that extra space? The Flipper Wall Panel is the perfect solutio.. Kids love to play tic tac toe, so The Tic Tac Toe Wall Panel is a no-brainer! It provides a fun game.. The Traffic Memory Wall Panel makes a fun and bright addition to any play area, classroom, home, or .. Looking for multiple fun activities in one? The Busy Train Activity Panel provides just that and mor.. The City Transportation Wall Panel brings out the excitement and bustle of city life! Kids have so m.. Happy Cows make Happy Play! The Cow Wall Panel will bring fun from the farm and liven up the walls o.. The Crab Mirror Wall Panel will bring the fun from the sea and make any wall exciting and fun! It fe.. The Dashboard Driving Wall Panel provides kids the excitement and fun of driving with no licen.. The Farm Wall Panel is decorative, fun, educational, and keeps kids busy! Children are endlessly ent.. The Frog Wall Panel is a wonderful addition to liven up the walls of any play area, classroom, waiti.. The Magnet Express Wall Panel is based on our original award-winning Magnet Express. It is fun..